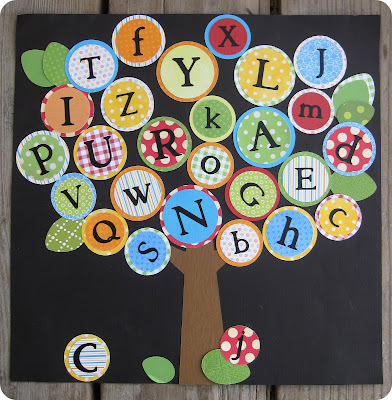 While going through some of my boxes the other day, I found this ABC Tree I made for my boys' room a few houses back. I'd kind of forgotten about it. My twins may have outgrown it by now, but my three-year-old loves it. Before the days of Pinterest, I used to just save pictures from blogs/sites in folders on my desktop (did anyone else do that?). I guess I was doing my own version of Pinterest. Pinterest is so much better because you can be linked directly to the source. 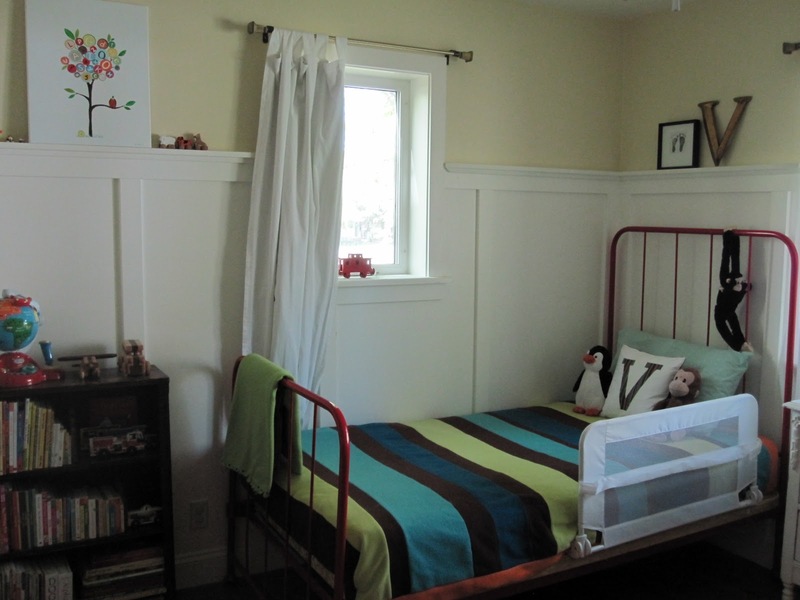 This darling room was in my 'Boys Room' folder from a couple of years ago and I don't have a source for it. I fell in love with the tree picture on the ledge in the top, left corner. I know it's a bit hard to see (click on it to see it bigger), but this is where my inspiration came from. She painted hers, and I like it better than mine, but I'm happy with how mine turned out. I'm not so good with paint, so thank goodness for scrapbook paper! I started by going through all my scrapbook scraps. I didn't go out and buy any new paper, I just made due with what I had (I like to force myself to do that once in awhile. It's easy to go buy something new for every project, but I'm always pleasantly surprised with what I can create when I use just what I have). 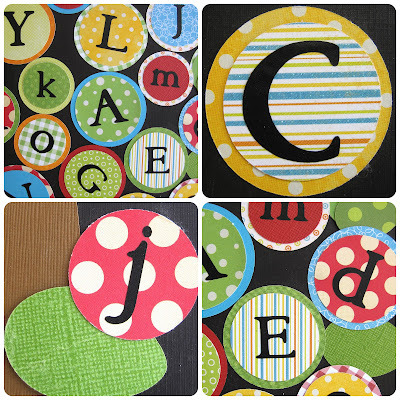 Letters Y, L, A, & N: 2" circle for the outer layer and 1 3/4" circle for the inner layer. Letters S, Q, V, B, C, M, X, K, & O: 1 1/2" circle for the outer layer and 1 1/4" circle for the inn layer. 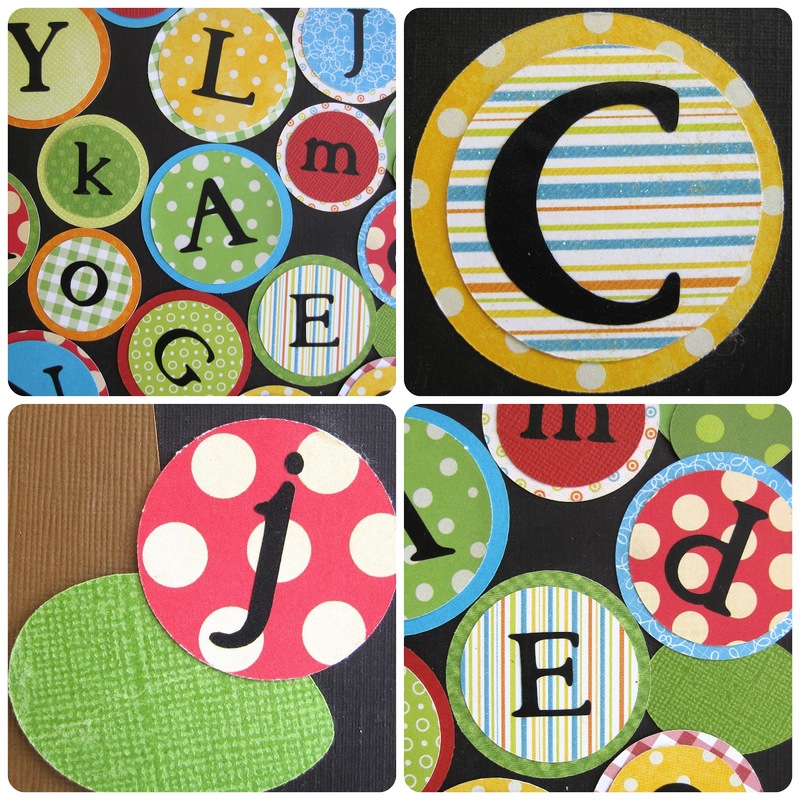 Letters P, I, T, F, Z, U, W, R, G, H, E, D, & J: 1 3/4" circle for the outer layer and 1 1/2" circle for the inner layer. The letter C & J at the bottom of the tree are the initials of my twins. The J is 1 1/4" and the C is 1 1/2" outer with 1 1/4" inner. I then cut black vinyl letters from my Cricut. I did some uppercase and some lowercase. The larger letters are 1" and the small ones are 3/4". I also used my Cricut to cut out the leaves and trunk, but you could easily trace some or freehand them. Arranging everything took a bit of time, but I just kept playing with it until it looked like a tree. Then I taped everything down. This was on my boys' bookshelf in their room. It would also look cute framed on the wall. You can also adjust the colors to make it more girly or whatever you fancy. Thanks you so much! I popped over to your blog to take a look and I'm in love with your recipe list! I'll be visiting often for some new recipes to try. Thanks again! Thanks for "Pinning"! I believe that's my very first pin. And thanks for becoming a follower! I'm super new at this, so it's extremely exciting to start finding friends out there. Thanks again! Brooke, this is awesome! I love this so so much! We are about to start fostering and the kids' room is a Dr. Seuss theme & Alphabeth theme. I'm definitely going to be making one of these! I've featured you today at this week's Pinteresting Link Party. Thanks for linking up! I hope you'll continue to share your projects with us. This is a darling idea. Pinning for later. Thanks. This is adorable! What a great idea! I would love for you to link this up to our new linky party, Give Me The Goods Monday! I am hosting with 4 other bloggers, 1 party but your links will show up on all 5 blogs! This is such a great idea! Thanks for sharing at Mix it up Monday! I love this!!! Will be pinning this and would also love for you to come and link this up to our party Much Ado About Monday.